stampwithamber - Amber Meulenbelt, independant Stampin' Up! demonstrator: Undefined ... what is it? Undefined ... what is it? Have you ever flipped through the catalogue and not found the image you were looking for? Do you have a custom design you always use as your signature? Or a tattoo that you'd like to replicate as a stamp? Well, now you can!! 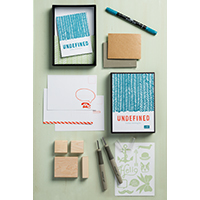 One of the new products I mentioned in my last post, Undefined, is Stampin' Up! 's new stamp carving product line. You design and then carve the rubber stamp any way you want, creating your very own one-of-a-kind stamp! Watch the video below for a tutorial on how you carve the stamp. They're being sold as both a kit and a refill pack (without the tools). I suggest you order a refill kit when you're ordering the kit, as it's addicting! Don't forget to share what you've created! Did you guys do this at convention - if so what did you make?